Map of Dawnmead circa 2E 582. Dawnmead is the easternmost region of the greater Reaper's March, located on the eastern end of the Crescent River. 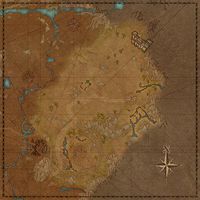 Dawnmead itself is a pocket realm of the Anequina region of Elsweyr, which consists of the northern portion of Elsweyr. The city of Dune is the Khajiiti Capital of Reaper's March and is the largest settlement in the area. The ruins of Fort Sphinxmoth is on the northern edge of the region and has been occupied by several ruffians and groups. Thizzrini Arena is a well-known arena in Reaper's March, with a wide variety of competitors. There are a few settlements inhabiting the area including Pa'alat and S'ren-ja. This page was last modified on 8 December 2017, at 23:41.